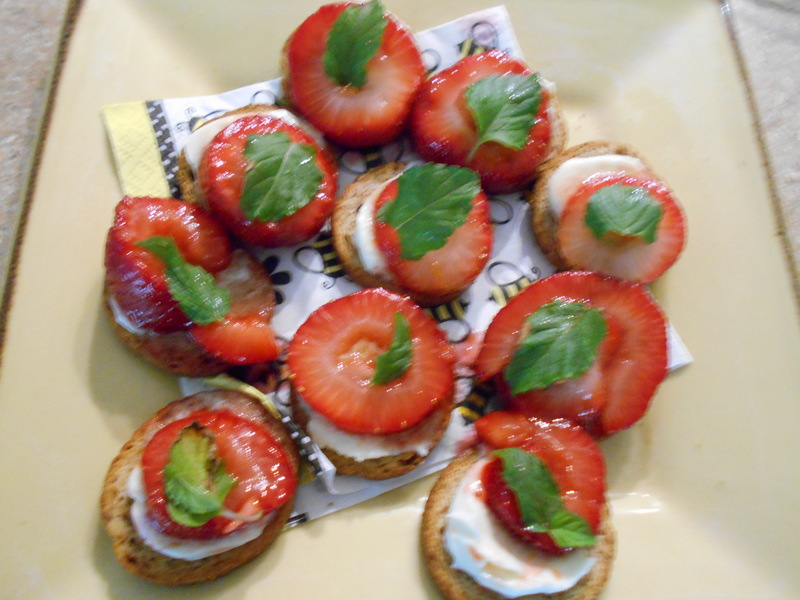 Strawberries for an appetizer? Yes indeed and I tell you, this is a really delightfully light and delicious treat to offer your guests for a hot summer day. Best of all, it’s a breeze to make. The only thing I have found that it’s best served when the strawberries are heated so that’s a last minute thing but not necessarily so because you can make the sauce ahead of time, refrigerate it for a day or 2 or even freeze it and then reheat it briefly in the micro (about 1 minute and I put the micro at 1/2 temp just to check that it’s not getting too hot and syrupy). In a small bowl, combine and whisk well the sugar, zest, juice and balsamic together. 3. If you are serving this immediately, I would recommend spreading the mascarpone on the crackers before you have made the sauce and have the crackers all ready on a pretty platter to finish off and serve. 4. After you have placed the sauce on top of the mascarpone, top each with a mint leaf. That will make the whole deal!!! Easy as can be to make and delicious—that’s what this desert is. Heavens, it takes no time what so ever to make (45 minutes at the most) and to bake; everyone will for sure think that it took you all day and will ouuu and ahhhh and probably, you won’t have any left over’s—so you’ll have to make another the next day just to satisfy yourself. Whisk flour, salt and sugar in a medium sized bowl. Cut in the butter in the dry ingredients till mixture is well blended and looks like cornmeal. You can use two knives, forks or a pastry blender, but if you have a processor, do the following: For the first 2 steps process the dry ingredients with a quick one, two pulse; then add the butter and process until blended and mixture looks like cornmeal. If you’ve used a processor, place your ingredients in a bowl. Add the water and mold with hands in order to make into a ball. Try to handle as little as possible so that the crust remains very light and flaky and will not become “heavy”. Place ball on a large piece of saran wrap; then place another sheet of saran wrap on top and flatten ball. Take a rolling pin and roll the top saran wrap sheet till your dough ball becomes a rough round of 9 or 10 inches (the dough should be about 1/4 inch thick). Remove your top saran wrap sheet, pick up the bottom saran sheet with the dough and quickly flip it out on a cookie sheet or pizza pan that has been lined with parchment paper or aluminum foil. Remove that saran sheet so that your dough is all by its lonesome on the prepared baking sheet. Now you are ready to place your desired filling in the middle of the dough. Pitted, peeled, sliced soft fruit; thinly sliced apples, pears; crushed almonds, walnuts, raisins, currents are all good filling choices. With fruit, you can toss them with crystallized ginger bits, cinnamon and/or sugar, honey and melted butter, lemon rind and whatever else you like. 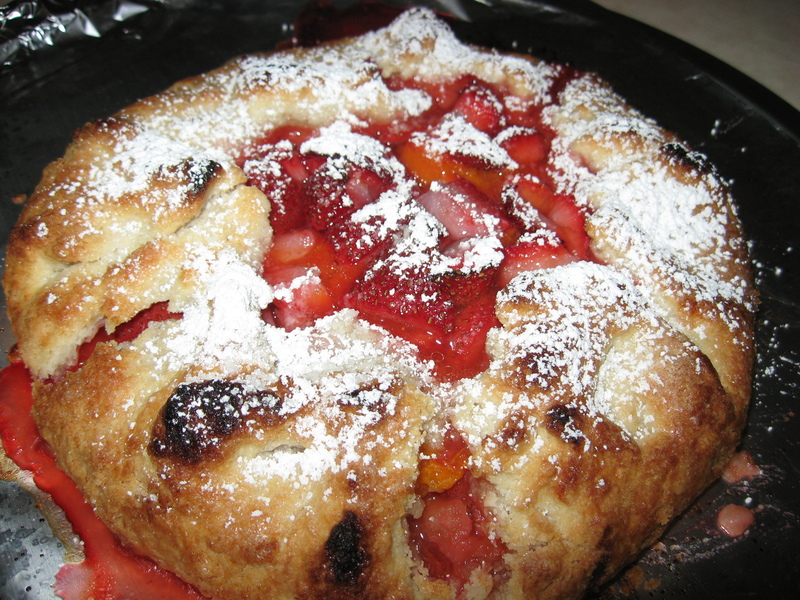 Place fruit, whatever in the middle of the dough leaving a good 1 ½ inch free border all around. Fold up the edges of the crust up and around the fruit, pinching the outer edge dough together. Brush the dough with 2 Tblsp. melted butter and save some melted butter for brushing on the fruit itself. I also place a bit more sugar on the top of all. Place the free-form pie which is on the lined cookie sheet or pizza pan in your pre-heated oven until the dough is nice and brown and the fruit is bubbling (about 30 minutes but start checking after 20 minutes). Remove from oven, cool on a rack and serve warm dusted with confectioner sugar and ice cream or crème fraiche or whipped cream. Cranberries are so versatile and freeze easily and well. They also are very healthy for you. However, their grand color makes them a favorite for Thanksgiving and Christmas. But don’t forget that “red” in Valentines day. 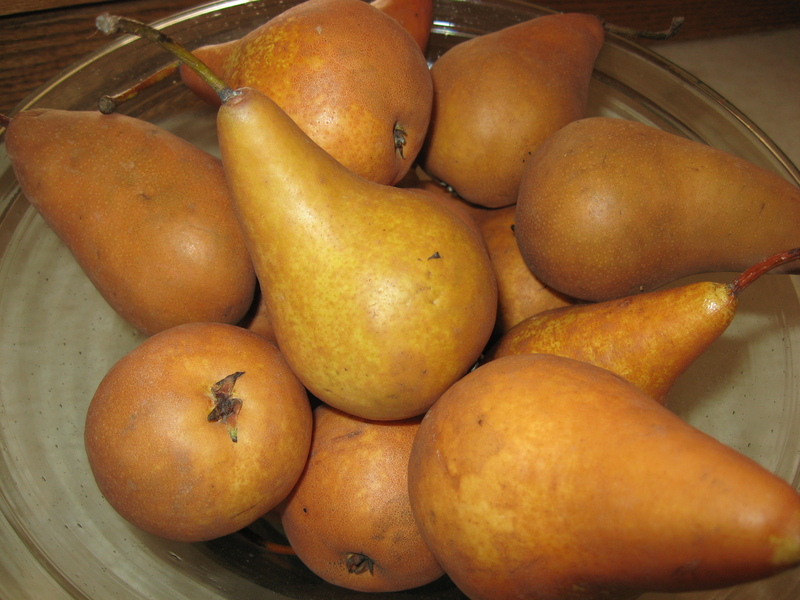 Frankly I think that this is a great fruit to use anytime of the year. So please do enjoy these 4 recipes which are among my favorites. 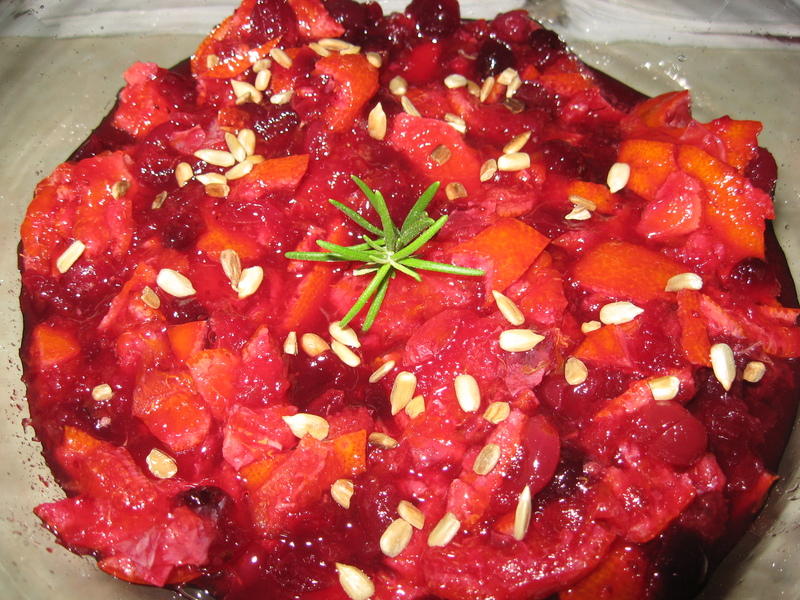 In a medium saucepan, combine the cranberries with the raisins, cherries, figs, sugar and water. Bring to a boil and cook over moderately high heat until the cranberries burst, about 6 minutes. Place into a bowl and refrigerate until chilled, about 3 hours. 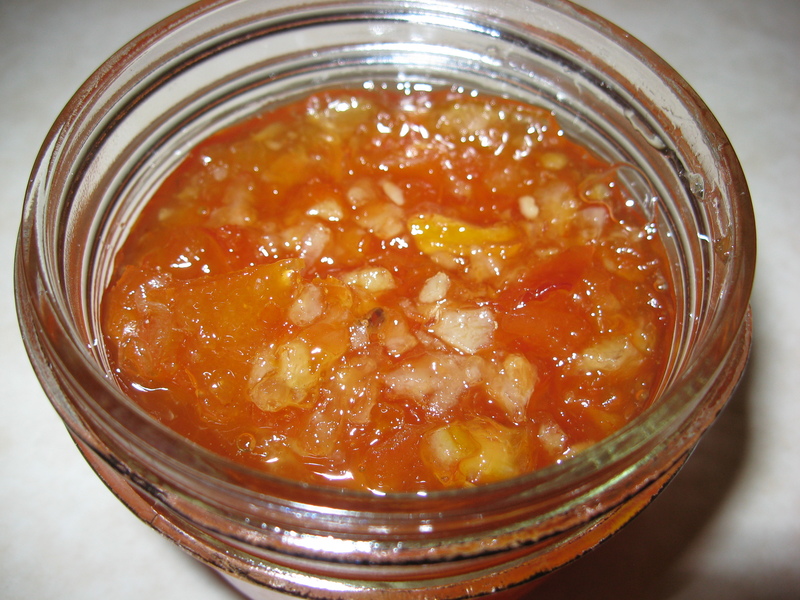 Make Ahead: This compote can be refrigerated for up to 2 weeks. Serve chilled or warmed. In a medium saucepan, combine the cranberries with the apple, sugar and water. Bring to a boil and cook over moderately high heat, stirring frequently until the cranberries are completely broken down and the sauce is very thick, about 15 minutes. Place the cranberry sauce into the prepared pan and refrigerate until chilled, about 3 hours or longer, however, make sure to keep the loaf in the frig. before serving. Don’t let it get to room temp before serving or you’ll be spooning it instead of slicing it. No matter though, it’ll be good either way. Invert the jelly onto a serving plate and remove the plastic wrap. Garnish with fresh cranberries and rosemary sprigs. Slice with a serrated knife before serving. 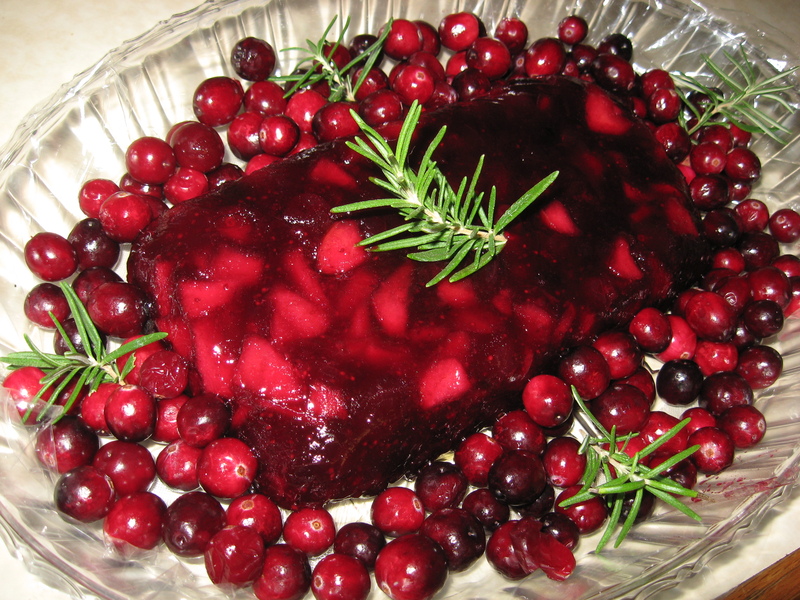 Make Ahead The cranberry sauce can be covered in plastic wrap and refrigerated for up to 2 weeks. Serve chilled. In a medium saucepan, cover the Clementine with water. Bring to a simmer and cook over moderately high heat until the skin softens, about 8 minutes. Drain and let stand until cool enough to handle. Coarsely chop the whole Clementine and discard any seeds. Wipe out the saucepan. In the same saucepan, combine the chopped Clementine with the sugar and water. 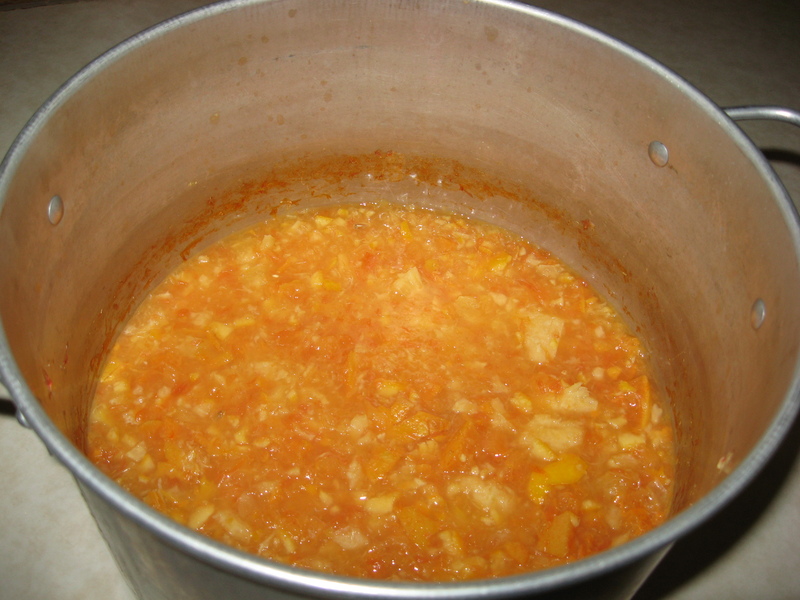 Bring to a simmer and cook over moderate heat until the Clementine peel is sweet, about 30 minutes. Add the cranberries and cook over moderately high heat until they burst, about 6 minutes. Put into a bowl and refrigerate until chilled, about 3 hours. Fold in the pumpkin seeds just before serving. Make Ahead The conserve can be refrigerated for up to 2 weeks however, don’t put the seeds in till just before serving. Note: To roast seeds, place seeds in a large sauté pan so there’s only one layer and cook over medium heat, shaking and stirring oven, till seeds brown and pop (anywhere from 5 to 10 minutes). They are best done right before using; however, you can store in a tight container for a day or so. In a medium-size heavy saucepan put 1 C. water, brown sugar, a pinch of salt and 12 whole pepper corns. Bring to a boil; add cranberries and cherries and return to a boil. Reduce heat and cook over medium heat for 10 minutes or until the cranberries have popped and the sauce has thickened. Cool to room temp, cover and refrigerate till cold. Make Ahead The compote can be refrigerated for up to 2 weeks.